Ideal for workgroups looking for better productivity, the Epson WorkForce Pro WP-4595DNF*6 offers an all-in-one device that works efficiently and provides users with a single machine to do a wide spectrum of basic document handling and communication tasks. 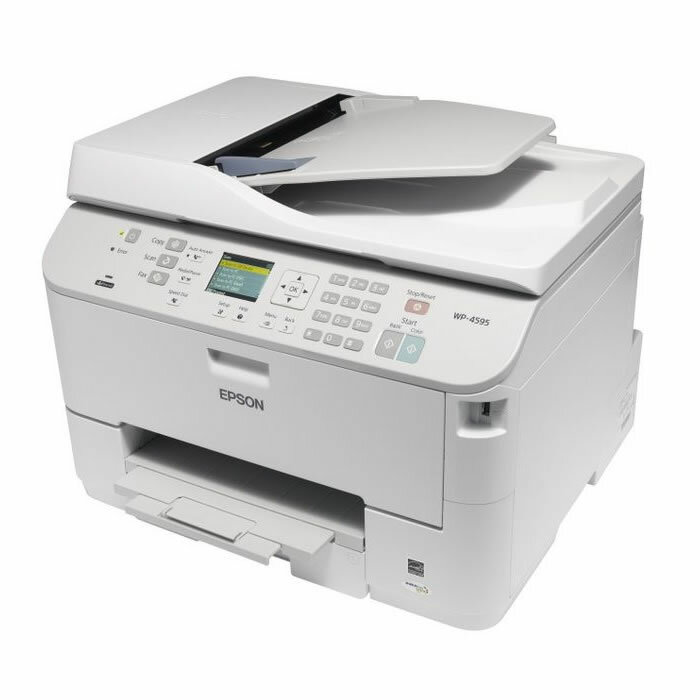 The Epson WorkForce Pro WP4595DNF*6 is capable of printing, scanning, copying, and even faxing. It boasts advanced features for each of its functions and is not expensive to run, unlike other multifunction devices. Its print rates, while not sluggish are not at par with competing laser and inkjet printers, averaging only 16 ppm and 11 ppm when printing black and white and colour documents, respectively. The Epson WorkForce Pro WP-4595DNF*6 inkjet printer looks like a typical multifunction device featuring its own automatic document feeder and auto duplexer, flatbed scanner and digital copier, and high-capacity paper trays for accommodating various types of print media. The Workforce Pro WP-4595DNF*6 multifunction printer boasts wired networking features. Home users can buy the optional extension for printing directly from mobile devices. Among the many benefits of using the Epson WorkForce Pro WP-4595DNF*6 printer is low running costs. Printer inks for the Epson Workforce Pro WP4595DNF*6 are not as expensive as for similar models, and have high page yields up to 1,200 to 2,400 pages, making costs per page very low. The Epson WorkForce Pro WP-4595DNF*6 offers average print speeds, which can be good enough for office and home use, although the Epson WP-4595DNF*6 print rates are not as impressive as more powerful inkjets and lasers. In addition to average print rates, the Epson WorkForce Pro WP-4595DNF*6 inkjet all-in-one printer disappoints when it comes to design as many users find it too bulky.